Since my last post we’ve had a couple of disappointing days; firstly Bentley Wood, where if I’m honest we jumped the gun a little on the butterflies. The (infamous) Eastern Clearing is still looking surprisingly drab with hardly any feeder plants. The birds were surprisingly silent too, but the major disappointment came with the state of the (small) pond. Desperately neglected last season, I was hoping they’d had a chance to clear the stifling growth, but alas this small and once quite productive little pond now resembles barely more than a muddy puddle. We did however manage to spot a couple of teneral Large Red. A return to Titchfield was perhaps a little hasty considering there was a low, with a brisk wind bringing some rather dark clouds from the north. The brief patches of sunshine were barely enough to wake the insects from their slumber, although one extended spell did raise them from the safety of ground level. Nowhere near the numbers we experienced on Thursday, but we were rewarded with all but one of that days’ cast – the Hairy being (unsurprisingly) absent. A day of rest on Easter Sunday (as it should be) with a good pelting of rain to replenish some of the ponds and water the plants. Refreshed and renewed we took a short local walk through one of our favourite valleys on Easter Monday. Away from the hustle & bustle of the great rush home we were presented with the heady scent of cut grass, Wild Garlic and Bluebells. 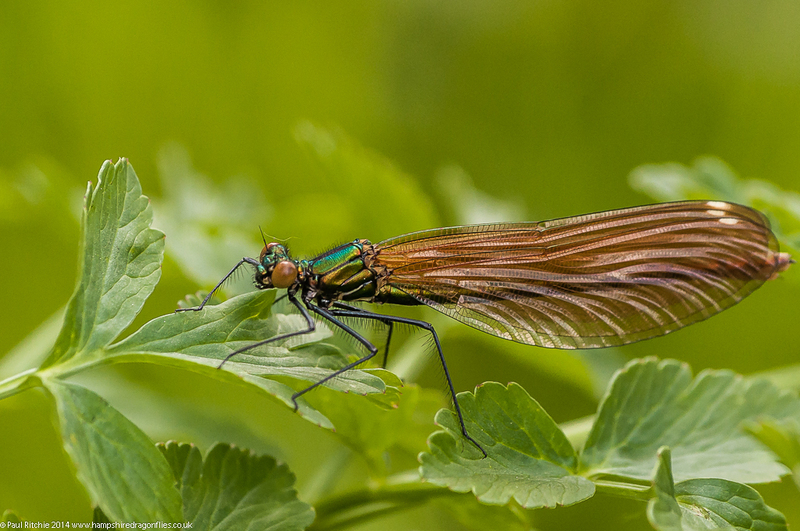 The water meadow carpeted in Spring flowers provided sustenance for foraging Orange-tips and Large Whites, but it was the fluttering among the nettles which caught my attention as the first of our Beautiful Demoiselles appeared in this rather hot & humid micro-climate. We found 16 in total, both male and female and mostly fresh. Durley has previously proved an early site for these, but this is 3 weeks earlier than last season. 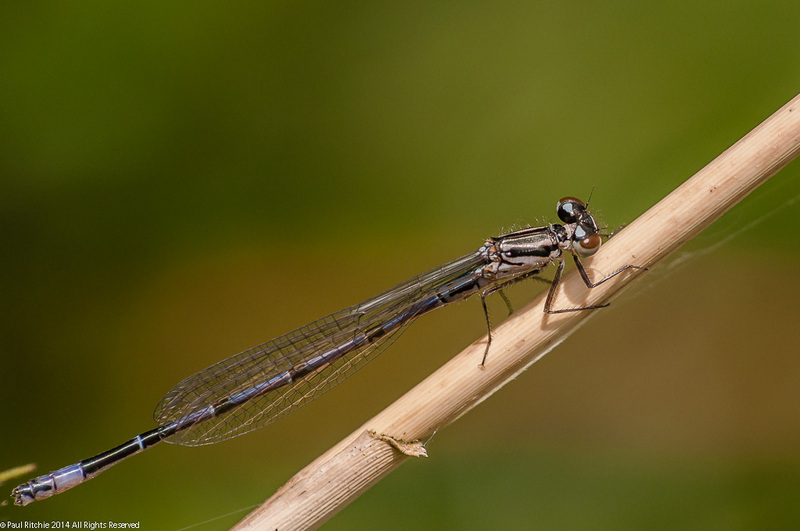 A brief meeting with a local naturalist confirmed she’s never seen them appear before May in several decades. A perfect choice then for a Bank Holiday stroll. It’s a few years since I’ve visited Titchfield Haven; in fact the last time I was so disgusted at the neglect of Darter’s Pond that I probably thought I’d save my money and look elsewhere. It wasn’t long before we found our first Azure, one of many males and females encountered. Also present were good numbers of mostly fresh Blue-tailed, but the stand out was this beautiful rufescens female. 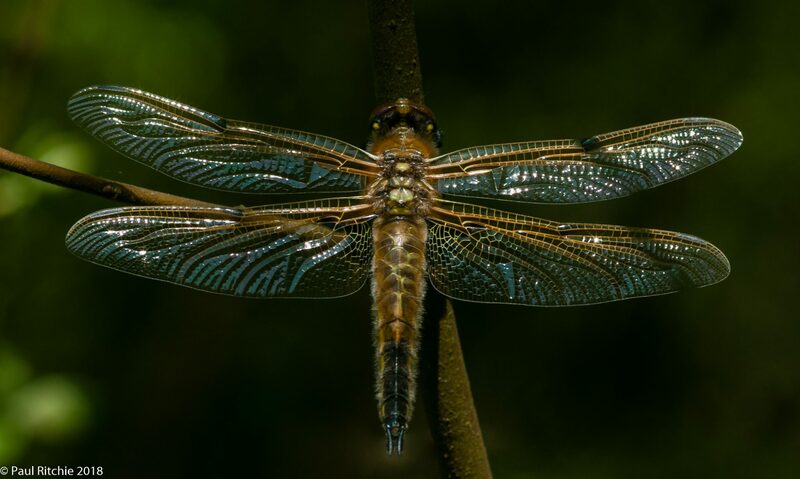 We were hoping for something a bit bigger as there have already been reports of Broad-bodied and Four-spotted Chaser as well as the stunning Hairy Dragonfly. Just after lunch I took a walk up the path only to be called back by Sue for something large. 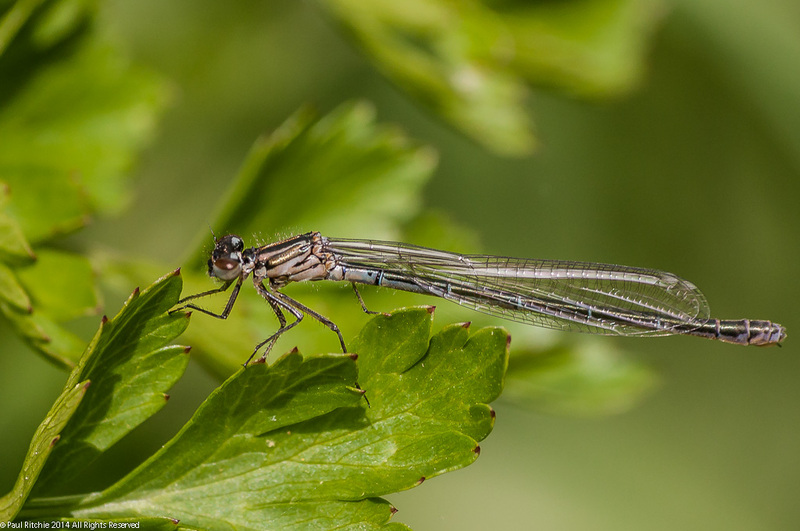 Indeed, it was a mature male Hairy Dragonfly patrolling the pond. For a good 10 minutes he entertained us – weaving in & out of the reeds and flying overhead and feeding on the wing. Unfortunately we both lost sight of him as he headed towards the hide, never to be seen again! So alas, no photo – but a welcome sight and good reason to revisit in a couple of weeks or so. 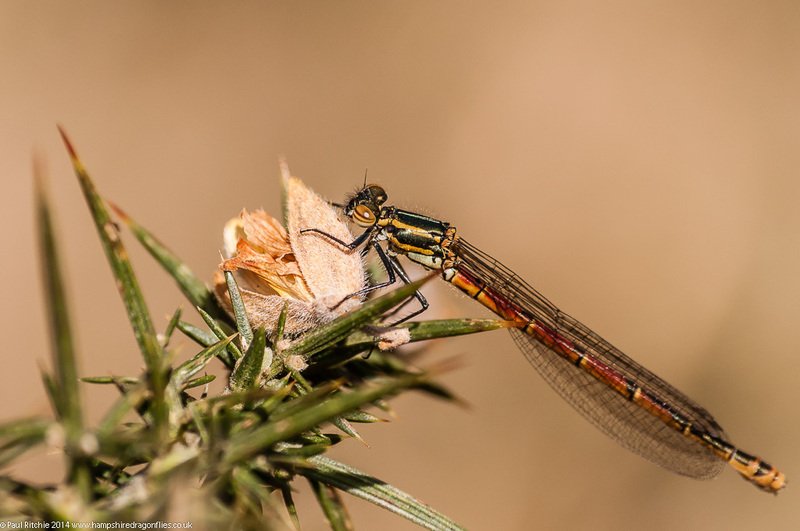 Reports of Large Red damselflies are now starting to appear from most Southern Counties, and there have even been reports of Broad-bodied Chasers and a Hairy Dragonfly. 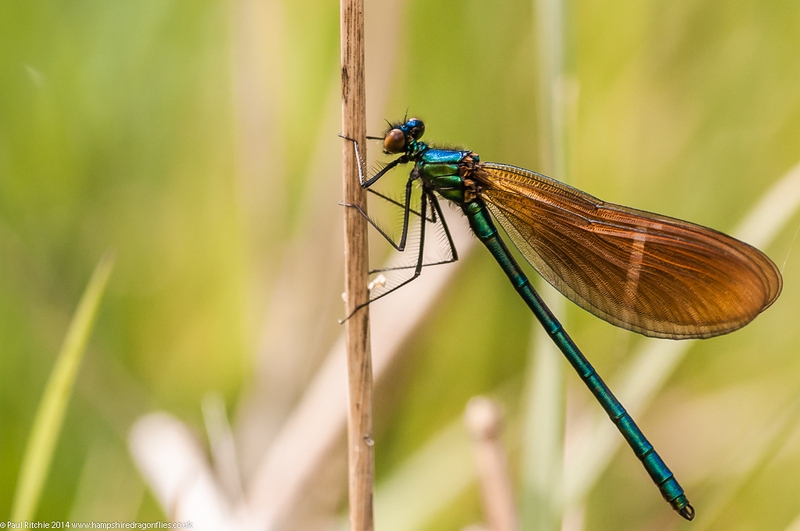 It will probably be a few weeks yet before we see significant numbers, but there is a good chance of early sightings this year if the butterflies are anything to go by. Already I’ve seen Dukes, Green Hairstreak and Grizzled Skipper along with the full compliment of Spring Whites. 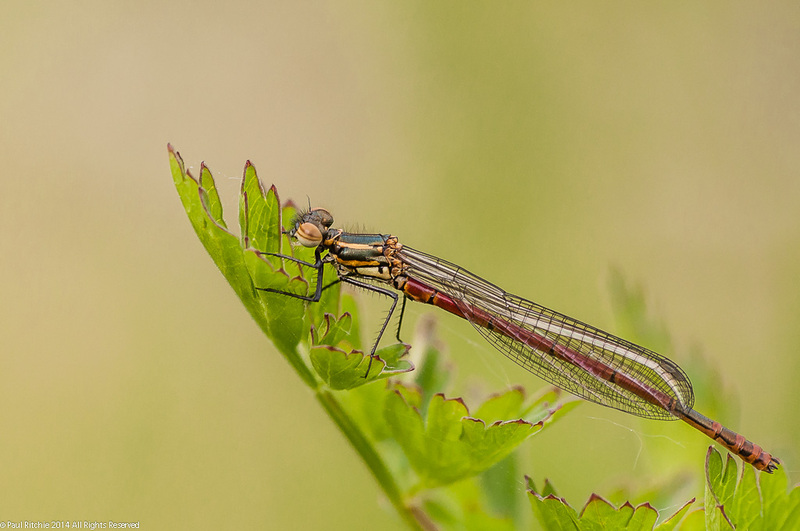 The New Forest has started to wake up with reports of Large Red from Denny Wood, Holmsley, Burley, and from my own visit yesterday, Cadnam Common and Broomy Pond. 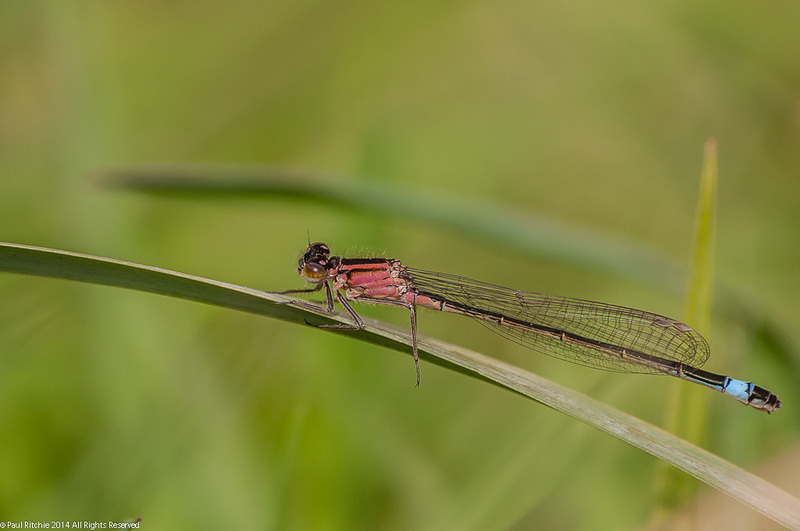 At the latter there were 30+ Large Reds spotted on a short transect. Things really didn’t pick up last season until May 1st, but given the warm spells we’ve been having lately it’s definitely worthwhile checking for more early risers. A warm welcome to my readers for the start of a new season. Happy to say my season started this afternoon less than half-a-mile from my doorstep. A small greenway bordering a stream providing one of those important ‘rural highways’ for our fauna. The path itself has been closed for two years through the inevitable urban vandalism, the last being setting fire to the raised board walk. The landowner has now re-routed the path to skirt the wooded valley, following the field edge and cutting a corner of the horse pasture to include a small, but rather charming, pond. With this new discovery I made a promise to myself to give the path a weekly visit, and it has already proved productive with new season butterflies. 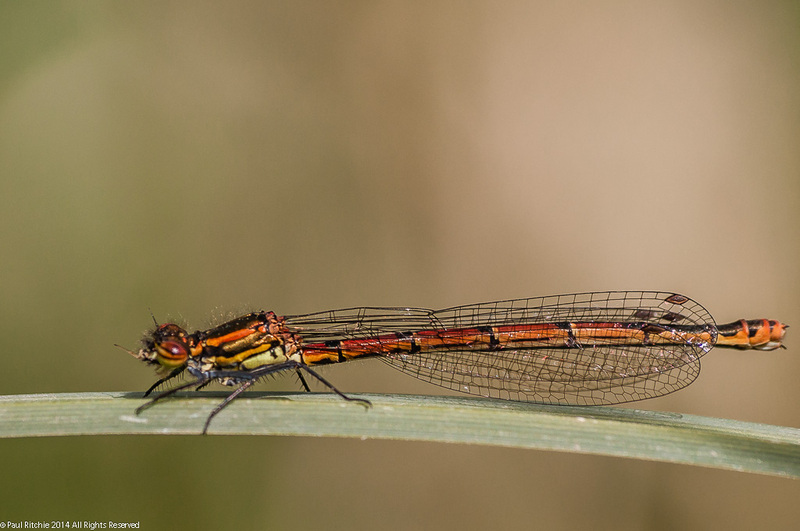 It was while I was searching out a female Orange-tipped when I spotted the familiar gossamer wings of a teneral damselfly. Luckily (she) landed not too far away on a bramble stem, but still proved amusing by hiding herself behind the branch. After much frustration and repositioning, she obliged. 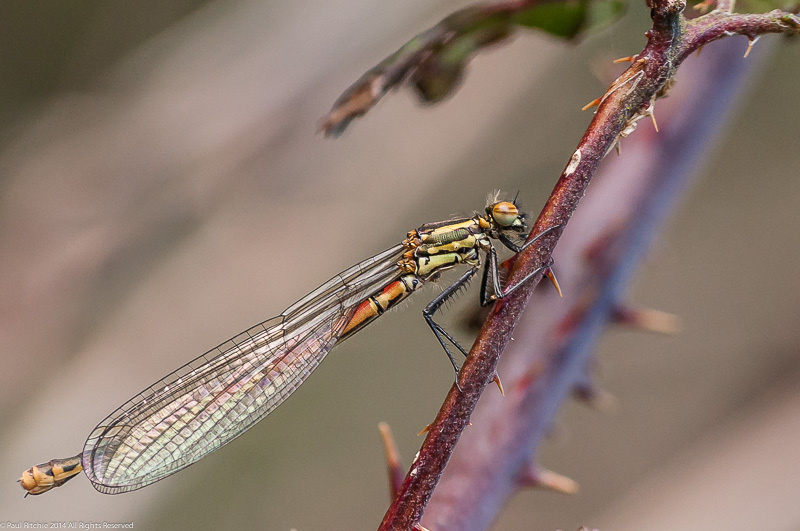 I have been keeping an eye out in the New Forest with a visit to Broomy – normally the first pond to show signs – on Tuesday and Friday of last week – but only the feeder insects were in attendance. Last year I had my first at Studland Heath in Dorset, so to find my first so close to home is doubly joyful!